I’m all about making my favorite restaurant meals at home. My family loves when I cook beef and broccoli stir fry, homemade egg rolls, and this easy bourbon chicken. Bourbon chicken is one of those dishes that always seems to pop up in the mall food courts. It actually originated in New Orleans and is named both for Bourbon Street and for the bourbon in the sauce, even though it has a decidedly Asian flavor. Whatever the origins, it’s totally delicious and super easy to make at home! 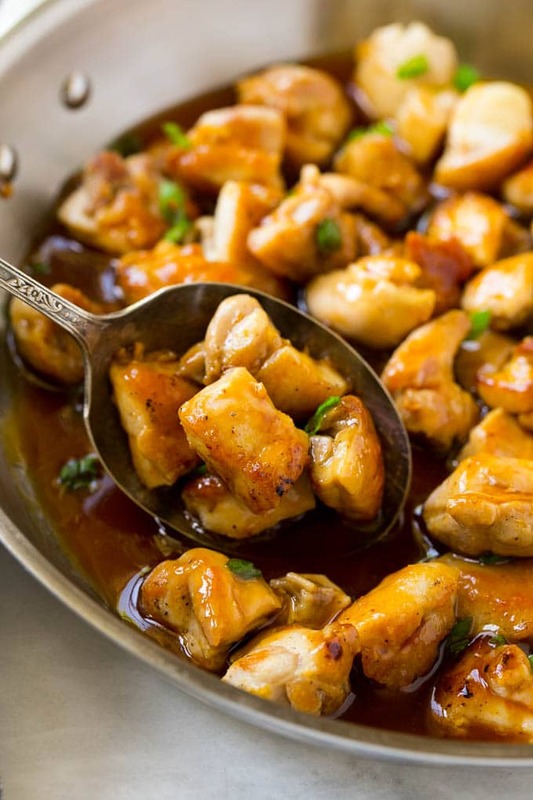 To make bourbon chicken, you’ll need chicken and a handful of pantry ingredients to make the sauce. I prefer to use boneless skinless chicken thighs in this recipe, just because that’s the way I’ve always had it in restaurants. You can also use boneless skinless chicken breast chunks if you prefer. The sauce looks like a long ingredient list, but you most likely already have all the ingredients in your kitchen. 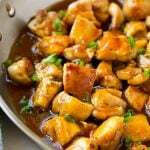 Bourbon chicken couldn’t be any easier to make – simply saute the chicken to a deep golden brown, pour the sauce over the top, and simmer. That’s all there is to it! 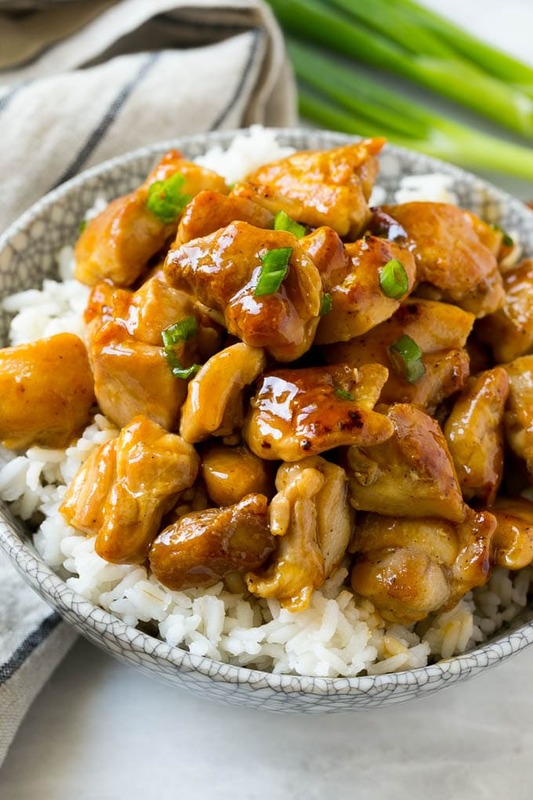 I like to serve my bourbon chicken over rice, and I start steaming the rice before I cook the chicken so that everything is done at the same time. Add a green veggie (broccoli in my house) and dinner is served! Does bourbon chicken contain bourbon? This recipe does call for bourbon, hence the name. The alcohol evaporates as the sauce simmers, but if you prefer not to use alcohol, you can substitute apple juice and it’ll still be delicious. I’ve made it both ways and they’re honestly both great. 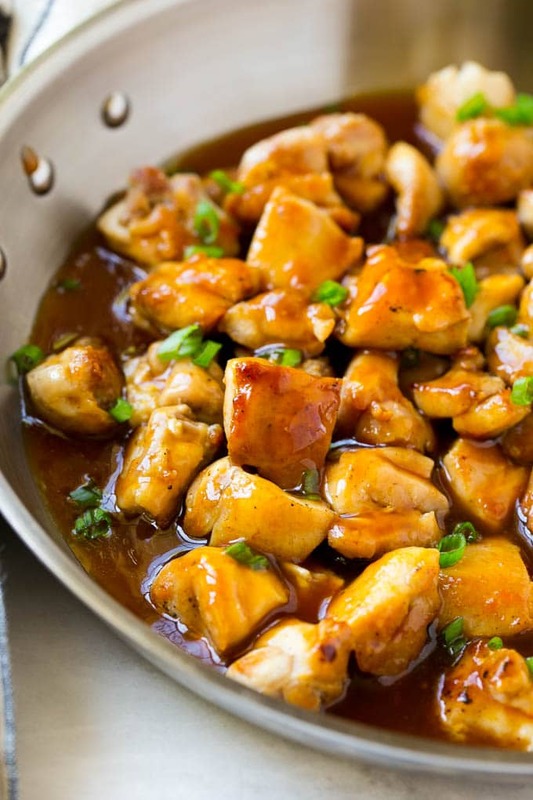 My kids even love this bourbon chicken, there’s just something about that sweet and sticky sauce that’s totally irresistible! Place the chicken in the pan and cook for 4-5 minutes on each side or until golden brown and cooked through. Add the garlic to the pan and cook for 30 seconds. While the chicken is cooking. In a medium bowl whisk together the bourbon, brown sugar, ketchup, apple cider vinegar, water, soy sauce and cornstarch. Pour the sauce mixture over the chicken and bring to a boil. Turn the heat down to low and simmer for 3-5 minutes or until sauce has thickened. Sprinkle with green onions and serve immediately, over rice if desired. I was going to make this for a wedding buffet. 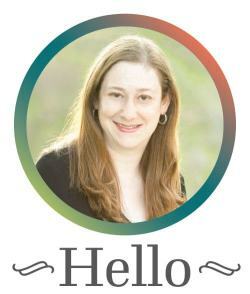 have you ever made it in advance and frozen it? Or how long can it stay in the fridge? It can stay in the fridge for up to 3 days before you plan to serve it! I think it would be fine to freeze too, although the sauce will be thinner upon thawing so you may need to add some cornstarch to thicken it up a bit. Hi, I’ve been wanting to make this dish for some time. Amazing!! The bourbon was a great accent! This dish is easy and Delicious. Will be making this often. Thank you for sharing this recipe. First time making Bourbon Chicken. It was amazing. I didn’t have bourbon or apple juice. I used unsweetened applesauce instead. Also used breasts instead of thighs. Will definitely be making this again. Thank you for sharing the recipe. So glad to hear it was a hit, I appreciate you coming back to comment!